The patient has chronic atopic dermatitis - notice the scratch marks on her forehead. She is aphakic with a corneal contact lens OD and has a developing cataract OS. The cataract that was in the OD went into intumescence very quickly. 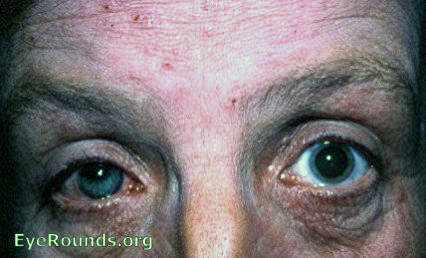 All atopic dermatitis patients must be followed carefully for cataract formation.